I’ve had a Bush radio for over 20 years. My wife bought it me not long after we were married. She bought it from a second hand shop in Otley, West Yorkshire. I’m guessing it was 1993. Which means I’ve had it longer (just) than I’ve had kids. But that’s not the start of it. This radio is a Bush TR82. It’s not one of the current batch of reproductions it’s an original. It was designed by David Ogle and was first manufactured in Plymouth in 1959. Mine is from around 1963. When my wife bought it the geezer in the shop turned it on and 1960’s hammond organ pop filled the room. Coincidentally it had tuned into the 1960s. She knew straight away that she had to buy it. It has taken pride of place in our home since then. Apart from a short period when DAB launched and I bought a Pure Evoke. But, although the Pure is brilliant, I missed the deep transistor driven sound of the Bush. I loved the way that it looks and I missed the loud click of the “off” wheel. I’ve always listened to the radio. Before Serial, before the podcast trend, I listened to spoken-word on the radio. I loved Radio Four from a teenager. It’s free education. You turn it on, listen, and when you turn it off you know more than you did when you turned it on. You can’t say that for Smooth FM. 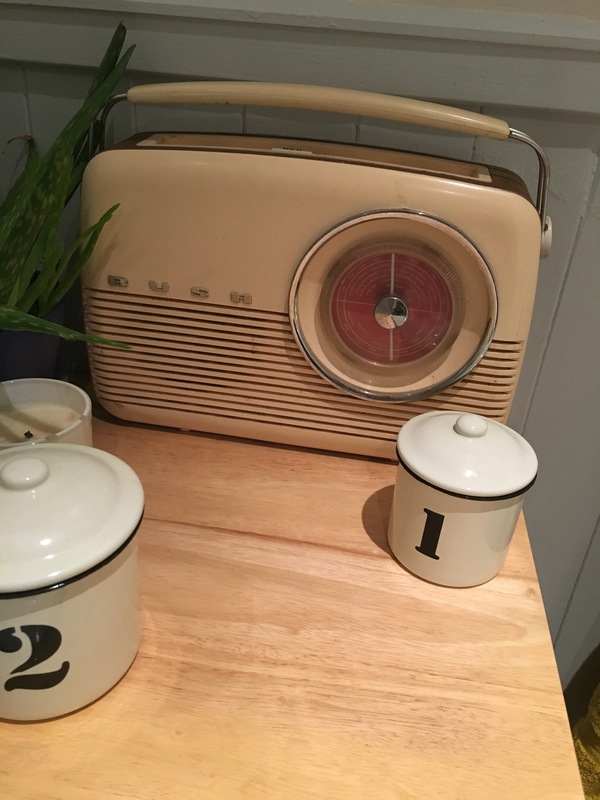 But clearly I could listen to any radio – indeed I had a great Sony radio in the 1980s and I currently use a Roberts Dab radio in the kitchen. So why do I love this one? The design is a classic. A thing of genuine beauty. I love the curved outline twinned with the perfect straight lines across the speaker on the front. I love the big circular tuning dial. I love the imprecision of tuning that leads to accidental finds. I love the fact that the back is held on with a single large screw. I love the weight of it. I love the press-stud pp9 battery. I love the warm transistor sound that tumbles heavily out of its one speaker. I love its clunky handle. I love the fact that someone has spilt varnish on it at some point and that someone else has melted it with something hot. I love the big clunky buttons that click into place so satisfactory. I love the big, proud BUSH letters across the front. I love the fact that it was made in Britain, that it was made to last, that it’s made sounds for longer than I have. The radio has spewed out music, spoken word and interference for years. It has told stories and accumulated stories. It is British, from an era when that wasn’t rare. It has been relaunched with DAB. It is a design icon. But I’ll be hanging on to my old one. It’s more than a radio, it’s become a friend.